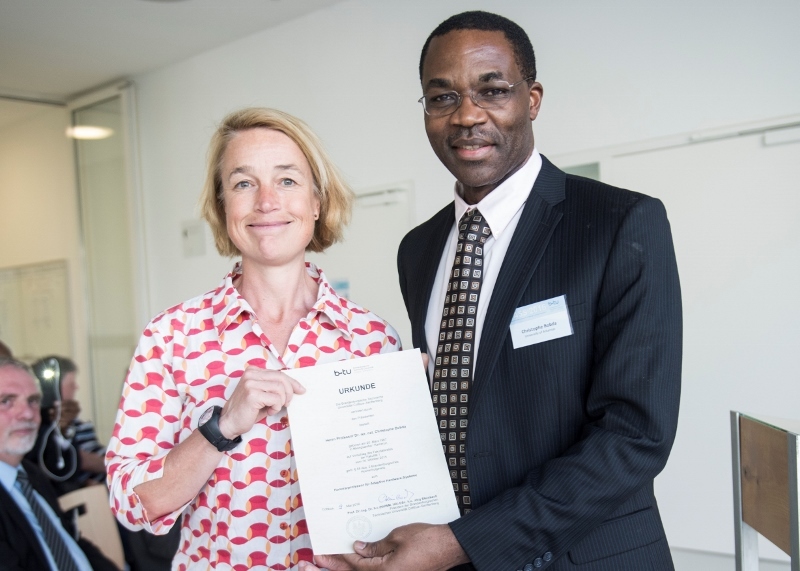 Christine Hipp, vice president for research at Brandenbug Technical University, awarded Bobda an honorary professor certificate. Christophe Bobda, computer science and computer engineering professor, was named an honorary professor at an award ceremony on May 11 on the campus of Brandenurg Technical University. Bobda has been working on joint research projects with BTU and the Innovative High-Performance Microelectronic Research Center at the University of Frankfurt (Oder) for six years, and he explained that the honorary professorship formalizes his relationship with BTU, giving him access to university resources and providing him the opportunity to work with BTU students. Bobda will continue his research collaboration with the institution and he will travel to BTU for a week once a year to teach a seminar. "The position comes with many benefits for all participants," Bobda explained. "It increases my access to funds that can benefit my students at BTU and would provide travel funding for Arkansas students, while it provides BTU with additional teaching and research. Second, I will be working with talented international students, who may be interested in pursuing graduate studies in Arkansas. Third, the University of Arkansas gets more exposure, and could benefit from the results of our collaborative research." Bobda has been working with two BTU professors, Rold Kraemer and Theodor Vierhaus in a joint lab that focuses on dependable sensor networks. The topics they investigate include smart imaging sensors, cyber security, reliability and self-organizing systems. In addition to collaborating in research, Bobda explained that his relationship with BTU provides valuable opportunities for student exchanges. Bobda, who is an advocate for global student experiences, has facilitated several international exchanges during his time at the U of A, and the Department of Computer Science and Computer Engineering has hosted more than 30 international students in the past five years. Bobda hopes that his new position with BTU will lead to more international experiences for students from both Arkansas and Germany. "I would like to congratulate Dr. Bobda for this achievement," said Frank Liu, head of the Department of Computer Science and Computer Engineering. "It is a nice recognition of his accomplishments and his efforts in international collaboration, and it is a great opportunity to expand the horizons of the faculty and students in our department."